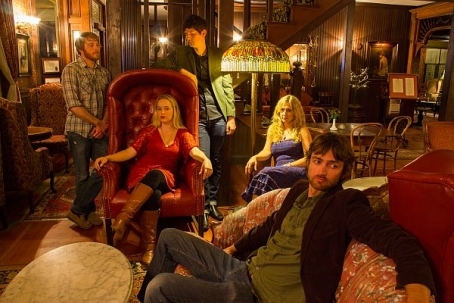 The San Francisco based folk band, Hidden in the Sun has recently experienced a jolt of success. Reeling from their widespread exposure from NPR Music, the band has recorded and released a music video for their single, San Francisco Blues from their full length debut album, Seven Seasons. The video was locally shot at the cozy, underground acoustic music venue Viracocha and gives you a chance to watch this ensemble of musicians give a great performance on the night of their album release show. The blending of beautiful vocals, the song's smooth blues folk instrumental vibe and the excitement of the audience makes you feel like you're in the room while watching this video. Get a taste of this stellar live performance and keep your eyes on this local musical outfit for their future endeavors.